Learn all about Generative Design. Designers define a specific material, design space, permissible loads and constraints and a target weight, and the software automatically computes the geometric solution. These results can be immediately manufactured on 3D printers. 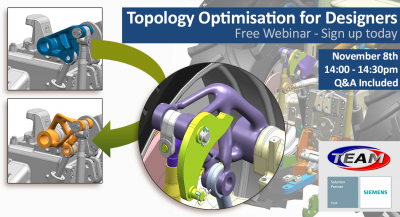 Our webinar will provide you with an overview of this new feature (new feature demonstrated on Siemens NX) and allow you to ask any questions you may have during a Q&A session about Topology optimisation.